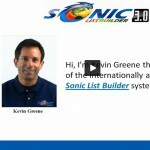 “Sonic List Builder”, by Kevin Greene and Chris Moran and found at soniclistbuilder.com, is an email list collecting tool that works to build your leads. You can also sell your lists to other marketers. This system, Sonic List Builder, is part of a set by Evergreen Automation, so it’s but one component of several in their website including Commission Robotics and Anytime Profits, which we have reviewed elsewhere on our site: https://scamxposer.com/business-review/anytime-profits. There is a certain strategy involved when list building to make it an essential component of a successful email marketing program. Doing it properly includes generating a high number of quality leads who are actually looking for what you’re selling; otherwise it can be a total waste of money and time. Sonic List Builder claims that their autopilot software will generate good lists quickly by generating squeeze pages. This can be a tough task for even most experienced online marketers to achieve. Most automated squeeze pages are now immediately recognizable and that is a problem because most people won’t engage with those typical automated funnel ad pages, but I’m sure it worked like a charm when Sonic List Builder first came out. Sonic List Builder claims their hands-free will build a valuable list everybody wants, but once inside, they let you know what’s really going on – upsells galore. Sonic List Builder costs $47 – with a monthly recurring fee for its email management service provider and there are upsells once you join, pushing you for $197 to build more squeeze pages for you. One other thing that bothers me is that you have to use their provider’s email management service, GetResponse. That service is incompatible with any of the standard ones available like Mail Chimp and Constant Contact, and it’s not compatible with any auto responders including AWeber, so I get that they’re in cahoots with Evergreen. Again, Sonic List Builder is just one component of a set, but it can be used as a standalone product. There is enough to go through, learn and do to keep you busy, so it’s not quite as leave it alone as Sonic List Builder hypes it to be. The quality of the Sonic List Builder squeeze pages are basic, so the opt-ins that subscribe may be of useless value to you. The quantity is also debatable. Some users have reported slow and mild builds over a long stretch of time, with few actual sales from the leads, and that is also a problem with Sonic List Builder’s claims. Buidling a list does take time, but when done the right way, like having a site that focuses on a particular niche market. Once you find it you build trust by offering sales, tips, a weekly bulletin, anything that gets people coming back to buy again. Sonic List Builder’s claim that you don’t need to do that is erroneous at best. So as part of a set, this may well work out in synch with Evergreen’s other products, but as a standalone, there are all those issues. You will at least get something for your money, like setting up a setting up a distribution network of backlinks networks and you will get squeeze pages and you will get leads. In truth, a solid marketing plan for successful sales is really what makes a good strategy, not cheesy pages of too many unfocused niches competing with others that look like yours, and the poor to mid quality leads that will rarely buy is not my idea of value. At the very least it is a Clickbank product so getting your money back won’t be an issue for 30 days to try it. It’s definitely not a scam, but I don’t recommend Sonic List Builder as a great standalone email gathering tool for beginners who don’t already have a great marketing strategy already.